Parenting is hard, and being able to laugh at oneself as a parent is almost a survival tactic. I’ve learnt to chuckle at my mishaps as a mom, and could sometimes even find the lighter side of tantrums, and nappy incidents. There are brilliant comedian parents such as Tumi Morake and Riaad Moosa who have made my ribs ache with their jokes. 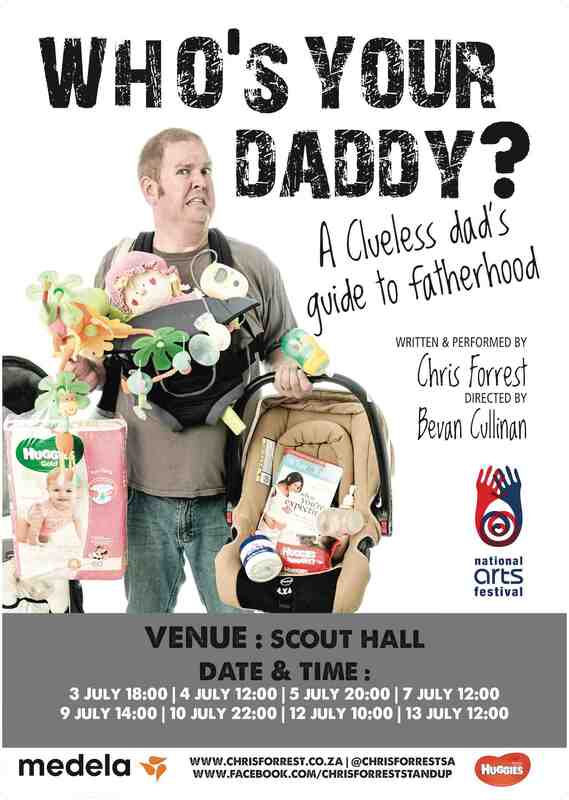 Coming up this month to share his hilarious account as a dad is Chris Forrest, who stars in the one-man-show Who’s Your Daddy. The show is sponsored by Huggies and Chris will chat about being a dad, plus the pregnancy, birth and looking after a child. The show is on at the annual National Arts Festival in Grahamstown until 13 July. Visit www.nationalartsfestival.co.za for more information. PS: The equally superb Bevan Cullinan directed the show – who remembers him from The Toasty Show? I used to get up at 6am just to watch his funniness.